Ask most Ultima fans what the first expansion pack sold for an Ultima game was and they would probably answer Forge Of Virtue. 8 years earlier (1984/1985) however there were a series of unofficial expansions for Ultima 3 created by the enterprising Joel Fenton of Backstreet Software. 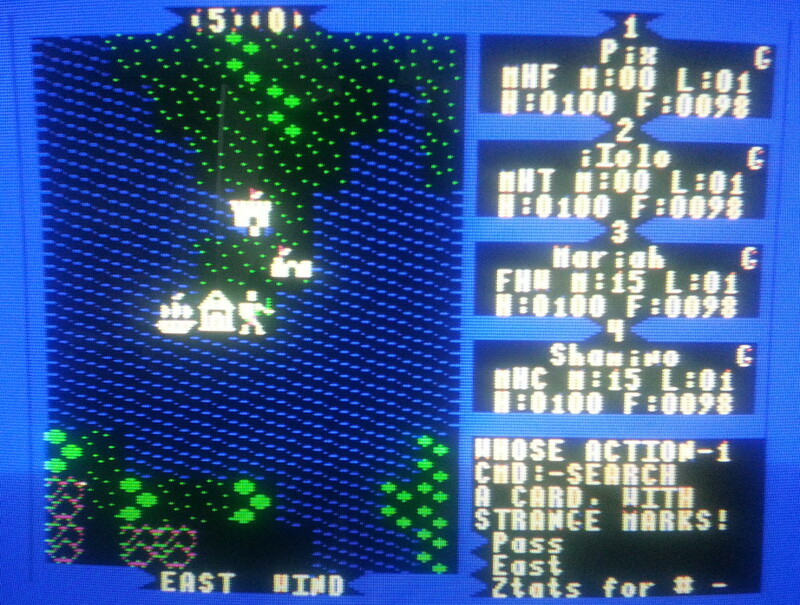 He had realised that since Ultima 3 on the Apple II loaded itself into memory from side one of a floppy disc and then loaded the locations from the other side, it was possible to create a new scenario by using a modified side two which had new versions of all the town and dungeon files. Having reverse engineered the file formats, he created his own expansions and put them up for sale. All of this was of course highly unofficial and presumably breached copyright but they did still require the original disk so it would be debatable. As far as I know the expansions where only ever sold directly via magazine adverts for $10 each. The evil legacy of Exodus has been revived by Maxman, a Priest of the Snake described as a shape-shifted balron. Maxman has built a castle stronghold and erected a force field of fire that separates the northern and southern hemispheres of Sosaria. Civil war looms between the north and south as Maxman attempts to wrest the throne from its rightful heir, the Viceroy Faerdin. That isn’t a whole lot to go on but I’m sure I’ll muddle through. It’s basically going to be Ultima 3 after all since the underlying game logic and mechanics are presumably unchanged. I’m going to be playing this on the original hardware which unfortunately for any reader means more photos of my TV by way of screenshots. I might get some sort of capture device one of these days but it hasn’t happened yet. 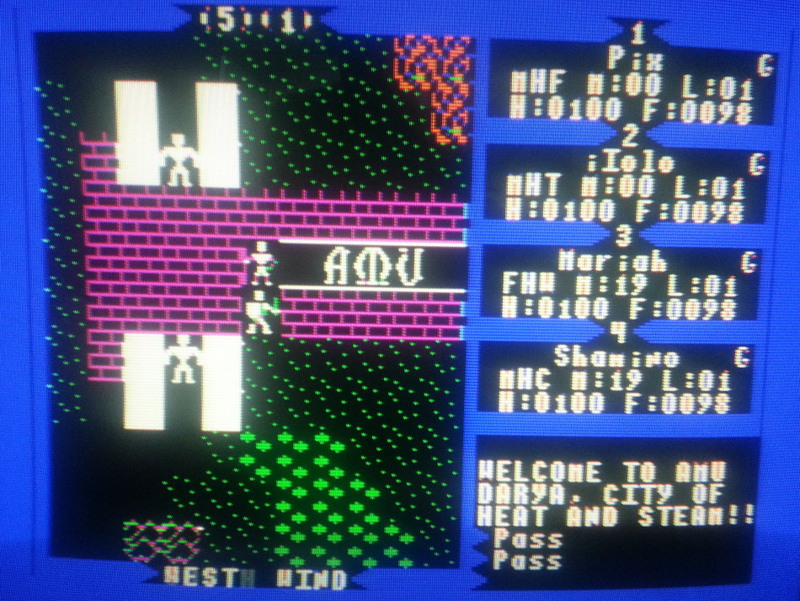 This was my first time playing the original Apple II version of Ultima which has proved something of a learning curve in and of itself. I don’t think I ever played Ultima 3 prior to the first PC fan patch or at least DOSBox being available and am used to some of the luxuries those options bring with them. 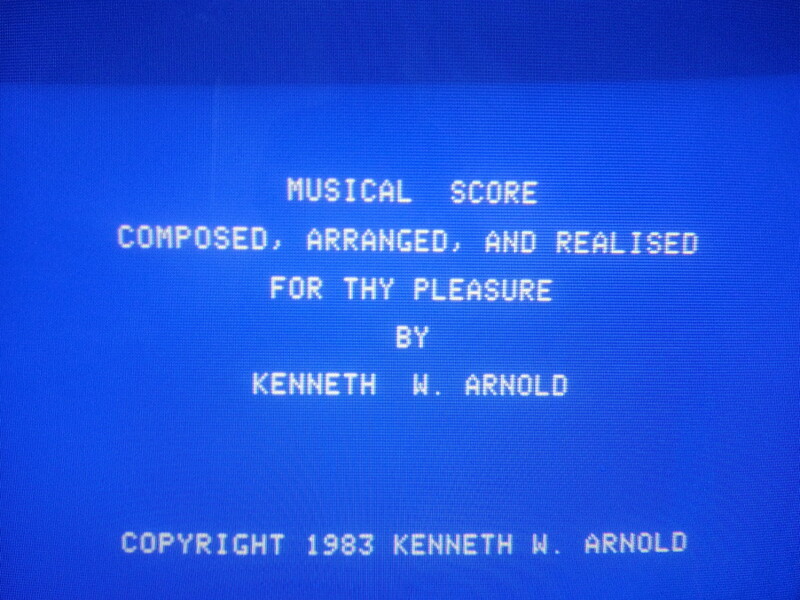 Something I hadn’t previously known was that Kenneth Arnold’s mockingboard soundtrack which I’d always thought of as such an integral part of Ultima 3 wasn’t actually included in the original Apple II release but was a later (albeit not much later) addition. 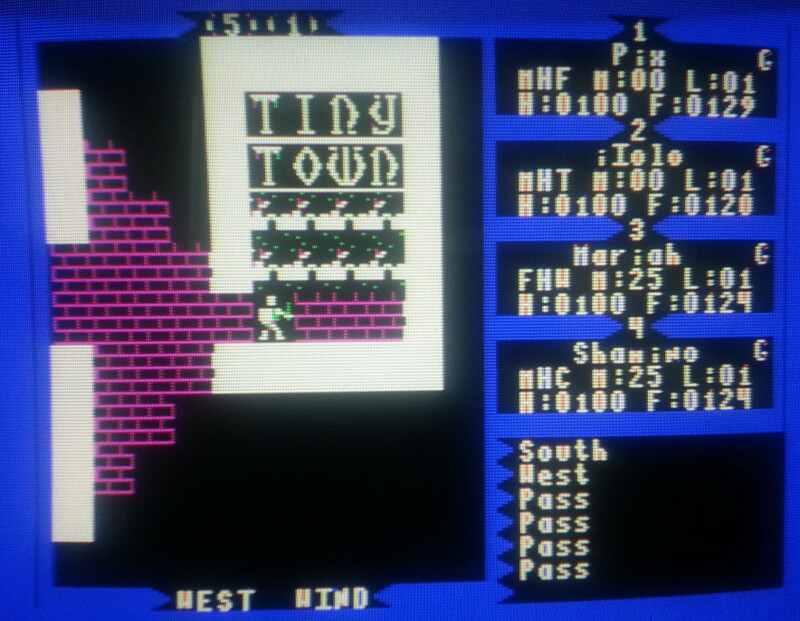 The second version appears to have come out in the same year (1983) and offers a choice of mockingboard versions on startup. 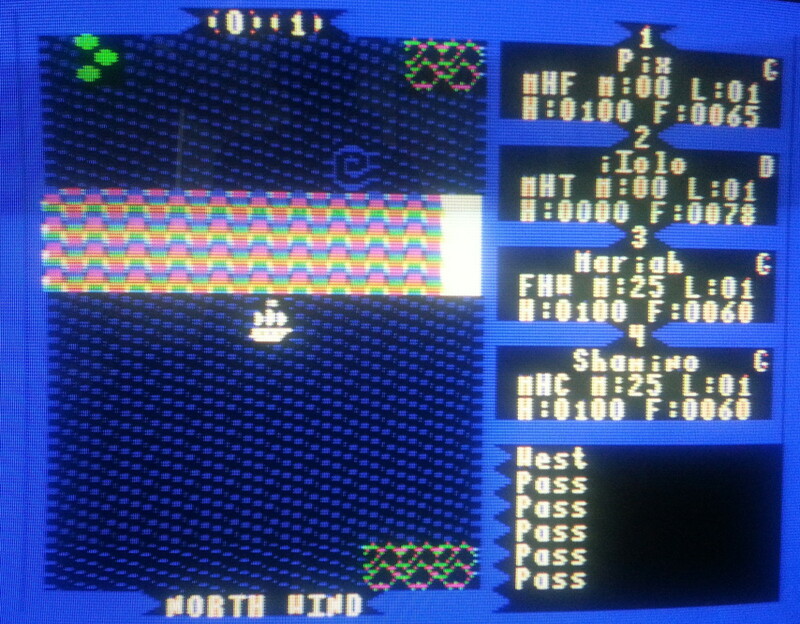 The game goes through the title animation, then asks for disk 1.2 at which point I insert the Ultimore disk instead. At this point in proceedings, no differences are apparent and these only show up after character creation. 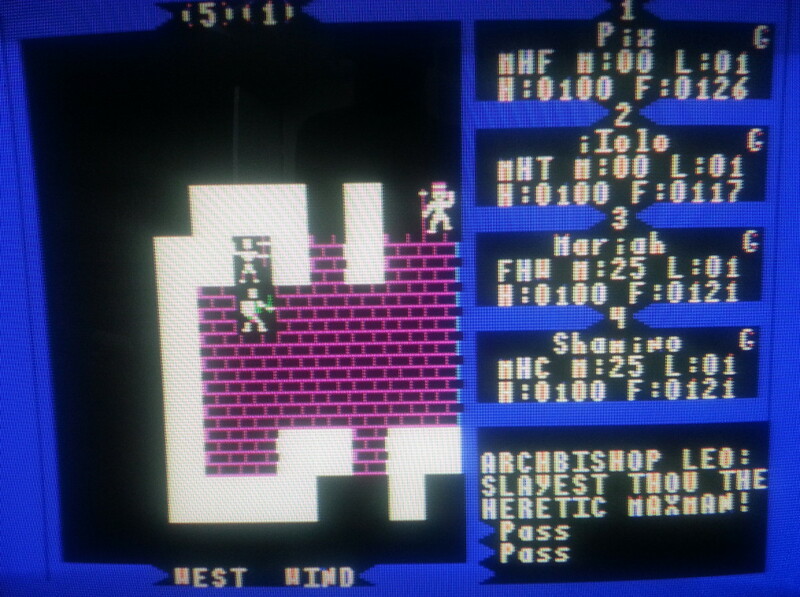 With no prior knowledge, I went for a traditional RPG party Fighter/Thief/Cleric/Mage with typically Ultima names. What isn’t typical is the layout of the land and I have no idea where I’m going with not even a cloth map to guide me. I have been provided with a ship from the get-go which will save some time with this Sosaria consisting of more islands than the original. I start the game out standing on a shrine which I can search to get one of the Exodus cards and presumably offer gold to raise stats if I had enough gold to offer. If there is an Ambrosia or it’s equivalent, it would seem like I won’t be required to go there to raise stats which should make things substantially easier. I head into the nearest town to buy a couple of slings and as much food as I can carry. The town goes by the name of Darya – City Of Heat And Steam and has plenty of fire fields to accidentally walk into to fit the description. 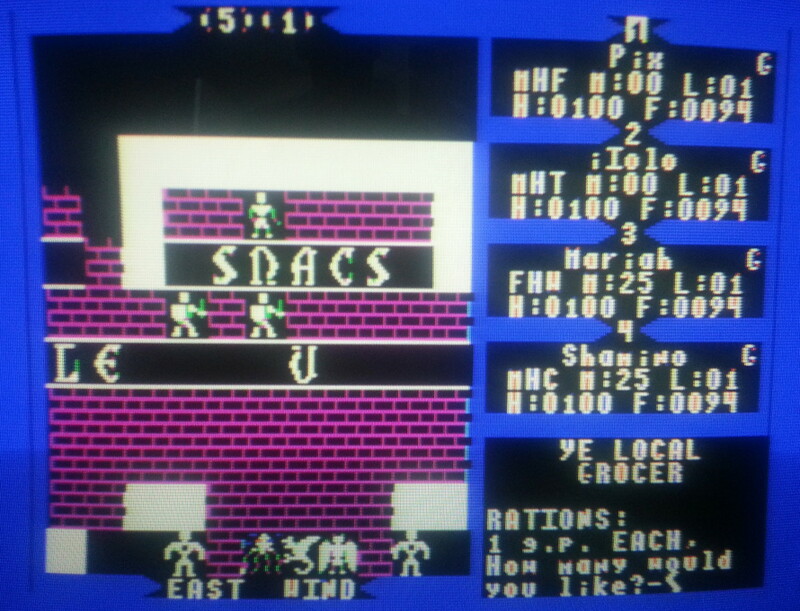 These highlight another problem with playing this game in its original form as I can’t reload the game after a bit of experimental exploring without restarting the Apple II and booting the whole thing up again. Worse still, should my party be killed off then the game is automatically saved with all my party dead and I have to start right from the beginning again. This is true oldschool RPGing I suppose but I’m definitely going to have to make a point of backing up my saves every now and then. I’m sure everyone would have done this back in the day. Darya has all the usual shops but not with their usual names. I don’t come across many people who have anything out of the ordinary to say. The original Ultima 3 very much set up the plot in the documentation which was barely expanded on in the game itself. With these limitations, not having a copious manual to read through is very much a detriment to the whole experience. The castle next door is home to Viceroy Faerdin who is standing in for Lord British in this version of Sosaria. He offers to raise my characters levels if they have enough experience. Elsewhere is what I presume must be a model village and an archbishop reiterating the main quest of slaying Maxman. There is a nearby dungeon which I should probably have explored at this point to gain some experience and gold but instead I decide to have a look around the world first to see if there is anywhere selling torches. As the title would suggest, this is indeed a world divided with great big force fields blocking passage to the North and South. I can spy a whirlpool floating around to the North which may shuttle me to the underworld later if I can get through to it. 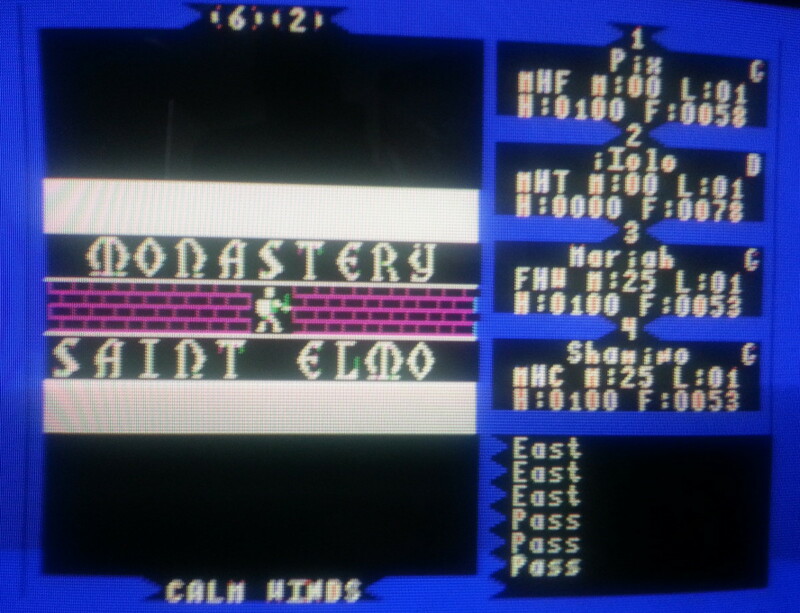 The next town I run into is the Monastery Of Saint Elmo. The main feature here is a room with dozens of shrines. I gather the other 3 cards while I’m here in case I need them later but I still don’t have gold to spare for any stat raising. 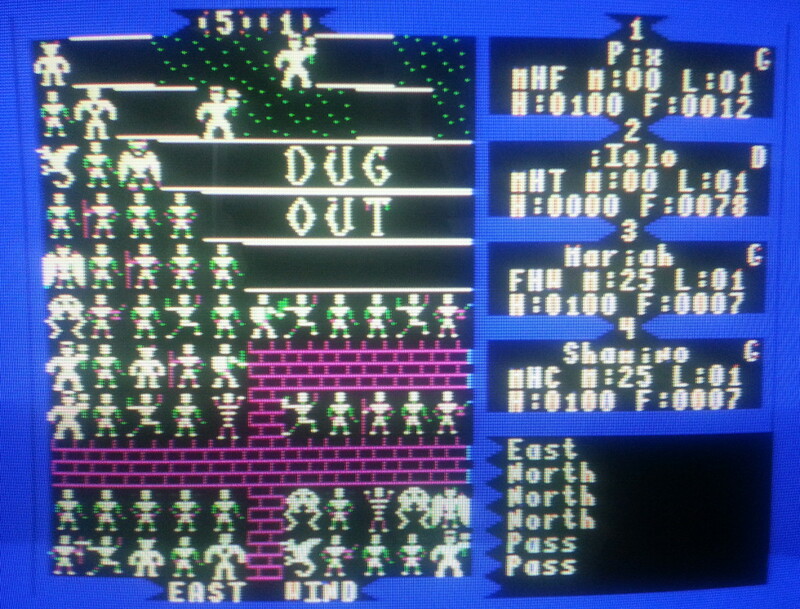 Last but not least I visit Wrigley Park, which is a recreation of the baseball ground in Ultima 3 tiles. 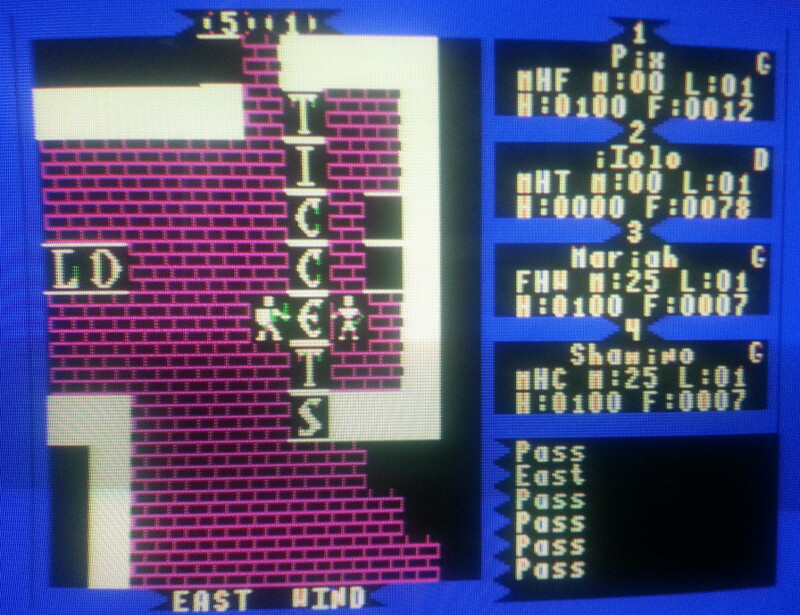 I don’t think there was a K tile in the original game (hence the misspelling of ticket) but this is the most unique location so far with quite the crowd looking on at the game. This could be a perfect spot for getting experience later on I’m thinking assuming my party is capable of slaughtering a whole stadiums worth of monsters. I can’t get on the field itself without some keys but I’m not up to bribing or killing guards yet so it will have to wait. I’ve been struggling to explore large portions of these towns in fact with doors and fields blocking my way. It’s more than possible that I’ve missed something but that’s all the locations I’ve managed to spot so far other than the single dungeon that was near the starting point. Assuming I can make it back to Darya without running out of food, it’s time I had a look into that dungeon and doing some levelling up. I haven’t seen anywhere to buy torches yet and will have to rely instead on light spells to find my way around. I’ve only had something of a scouting exercise so far to get an idea of what I’m up against. I’ll need to do much the same in the dungeon and intend to map it out in true olde-worlde style on graph paper. I’m hoping for some easily accessible chests/fountains on the first level which I can use for some quick levelling up/gold gathering. With only the one dungeon in site and all the shrines immediately accessible, I’m getting the impression that this scenario is going to be substantially cut down in size on the original game but it’s still great fun to be able to take on an alternative Ultima 3 and I’m more than curious to see what it has in store. 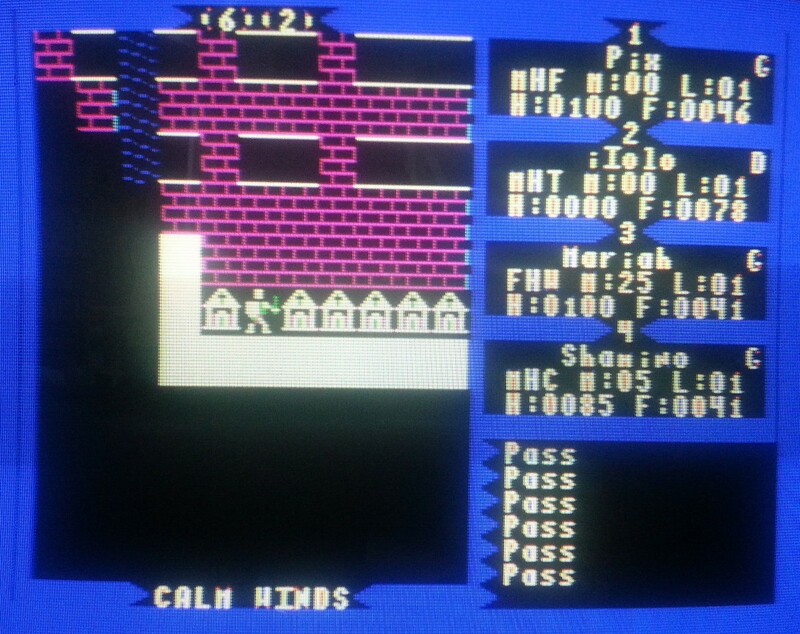 This entry was posted in Ultima 3 by Pix. Bookmark the permalink. I heard about those a long time ago but never bothered checking them out. I wonder if it just use map files, in theory, those could also work for the PC version. I’m fairly sure it’s just map changes so it may well port straight over to DOS like you say. I’ll give it a go when I get the chance and see what happens. Did you ever try this? I’ve been trying to get my hands on this since 1986 or so, so I’m beyond ok with downloading an Apple 2 emulator if needed. A thousand thanks. Seriously. Yes but I didn’t get too far as I never figured out how I was supposed to increase character stats. I expect I was missing something obvious. I really should have another look at it sometime. Have you tried to contact Mr. Fenton at all? See if he has copies of the other add-ons laying about? Have you any idea where to contact him? The only email I could find (jfenton@netins.net) bounced back. It was from 2004 so that’s not too surprising. I couldn’t see anyone all that likely on Facebook and he isn’t on the rosta of dragons. And also, very cool find! If you post the files, I’d love to give it a try too. Yes, WTF has already been in touch with him. With a bit of luck we may get to see the rest of these expansions some time soon. If you are able to create a disk image, I’d love to try this. Any progress on disk images yet? I’ve not heard a thing in months. I never did get that far playing it either as I couldn’t manage to raise my stats. 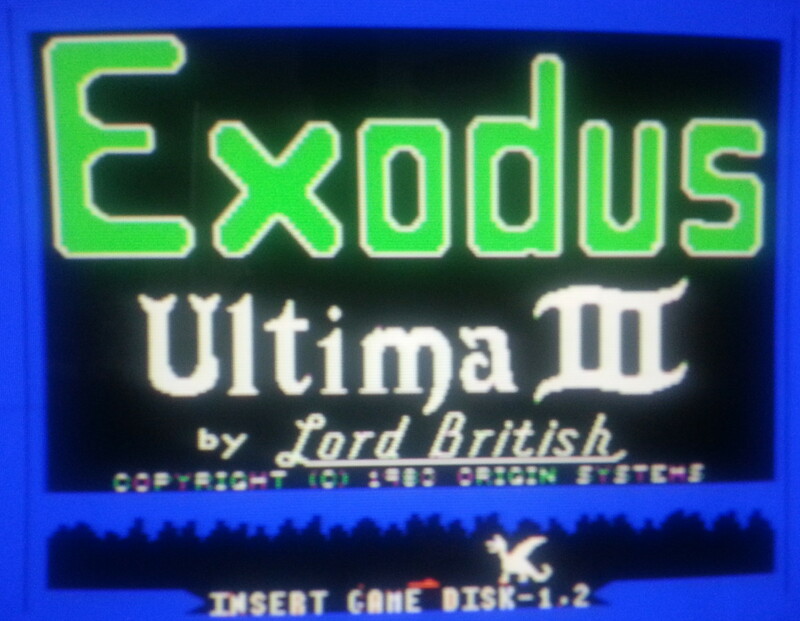 I wouldn’t normally share games on here but since the author was allegedly ok with it + he didn’t really have the authority to sell it in the first place I’ll make an exception and put the disk image of the one Ultimore I do have in the downloads section now.